Dandelion Greens - Got Greens? A powerhouse of anti-oxidants, Dandelions are nature’s richest green source of beta-carotene, the third richest source of Vitamin A of all foods, and has been found to contain vitamin D. Eating Dandelion is extremely beneficial to digestion and supports the liver and kidneys. Dandelion root contains inulin. Blend and enjoy. An excellent health tonic. Dandelion is corrupted French for ‘dents de lion’ (tooth of the lion), referring to the jagged edge of the leaf. It is universally considered a noxious weed that attacks lawns but drinkers of green smoothies know better. While considered by many to be a bitter green, be sure to eat young leaves before the plant has begun to flower as the leaves become more bitter once the plant begins its flowing stage. Throughout history, Dandelion has had a reputation as being effective in promoting weight loss and laboratory research indicates that there is some support for this reputation. 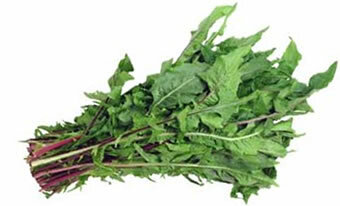 As well, Dandelion is a powerful liver and kidney cleanser.